Wine is low-carb by nature but that doesn’t mean you’re off the hook! Our bodies metabolize alcohol a little differently than other foods. This guide will help you understand and choose the best wines for your needs. If health is something you care about, you can create a balanced diet that includes a healthy dose of wine. We consulted with Dr. Edward Miller for a general understanding of what’s really going on with alcohol and health. How many carbs are in wine? *This is based on a standard serving of 5 ounces with up to 20 g/L of residual sugar (which is noticeably sweet). Dry wines typically have less than 2 g/L RS and ~0 carbs. First things first – everyone’s physiology is different. If you are seriously overweight or have a severe condition, talk to your doctor about your health. 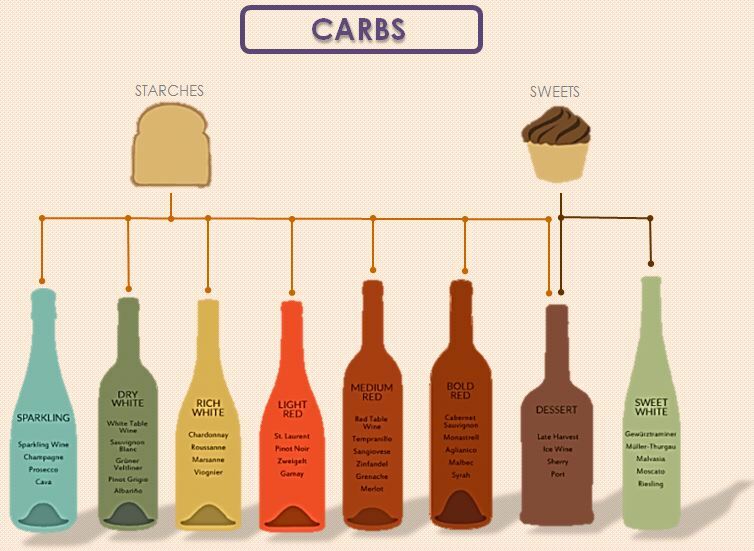 Where do carbs come from in wine? Unfermented sugar. However, in most cases this is not a significant contribution. Fermented beverages, by definition, start as a high-carb (the sugars fructose and glucose) plant, usually grapes (wine) or a grain (beer). During the fermentation process, the yeasts eat the carbohydrates producing alcohol, heat, and CO2 (bubbles). Whatever sugars are left over contribute to the total carbohydrate in the beverage, which varies from one drink to another. A dry wine has little to no residual sugar, whereas a sweet wine can have quite a bit. Liqueurs have sugar added, often quite a lot. Distilled spirits (vodka, rum, whiskey, etc.) have nothing left but the alcohol, so are zero carbs. However, mixers are often sugary, so watch for this. Just two ounces (1/4 cup) of “sweet and sour mix,” often used for whiskey sours, daiquiris and margaritas, has 17 grams of carbohydrate. Liqueurs such as Amaretto or Creme de Menthe almost always have sugar added, and sometimes a lot. What tips should I follow to make sure I’m drinking in a healthy way? Some recent studies have shown that alcohol increases appetite and some people take in 300-400 more calories a day when drinking. From what I can glean, this is more likely with spirits (“those chips and guacamole would be great with this margarita,” “I’ll have another order of fries with my next beer,” etc.). So be aware of a possible tendency to eat more when drinking. Diabetic diets generally restrict carbs to 70 grams per day, Atkin’s is generally 20-30 grams/day. Both dry white and dry red wine only have up to 4 grams per 5 oz. serving and dry wine has a glycemic index of 0. “Here’s the problem with all alcoholic beverages, and the reason I recommend refraining from alcohol consumption on the diet. Alcohol, whenever taken in, is the first fuel to burn. While that’s going on, your body will not burn fat. This does not stop the weight loss, it simply postpones it, since the alcohol does not store as glycogen (starch), you immediately go back into ketosis after the alcohol is used up. 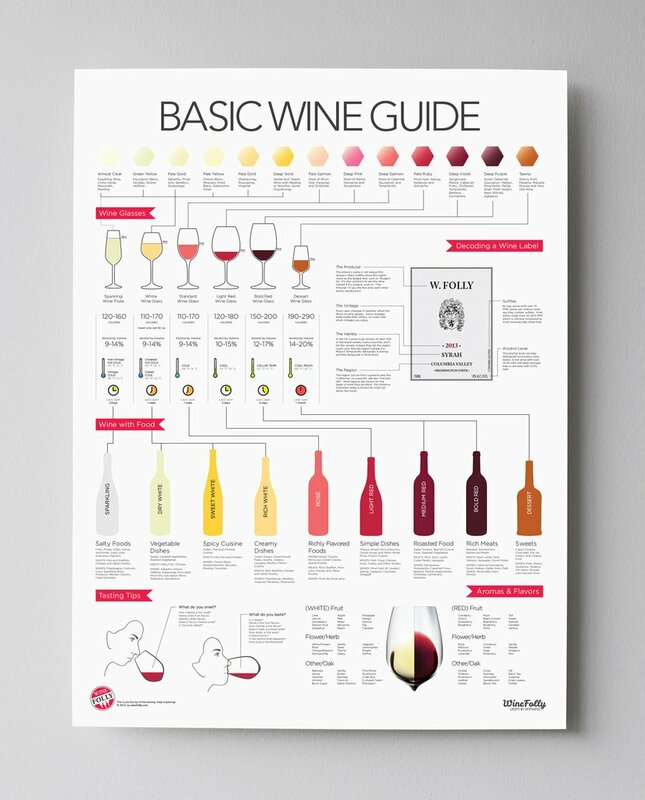 Check out the Basic Wine Guide Infographic for details about everything from calories to food pairing on the 9 basic styles of wine. So carbs cause sugar to be stored as fat in the body and also inhibits getting the fat back out of fat cells to be used as an energy source. It all makes survival sense: when fruits and vegetables are ample, we store the excess sugar as fat where it can be utilized in the winter when nutrition is not as plentiful. Generally speaking, many commercial wines below $10 a bottle have slightly more residual sugar —even for a dry wine. This is because just a touch of sugar adds quite a bit of body and texture as well as accentuating the fruit flavors. It’s not necessarily a bad thing. That said, it’s a safe bet to spend a little bit more if you’re really into purely dry wines. Of course we’re talking about the difference between 0 and about .5 grams of sugar per glass, so it’s really not as bad as say, a can of cola (at 44 grams!). Special thanks to Dr. Edward Miller, our health advisor, for clarifying what carbs in wine really have to do with health. You can find the doctor sipping red wine and contributing to other topics on Wine and Health. Next What Exactly Are Old Vines?